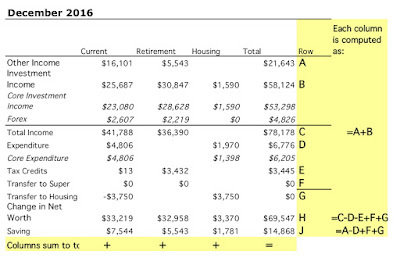 Spending (not counting mortgage) was moderate at $4.8k. Salaries, tax refunds etc. added up to $16.1k (after tax). I received some payments from a consultancy firm I did some work for. More is coming. After taking into account the mortgage payment of $3.7k (which includes implicit interest saving due to our offset account - the actual mortgage payment was almost $600 less than this) - which shows up as a transfer to the housing account, we saved $7.5k on the current account. 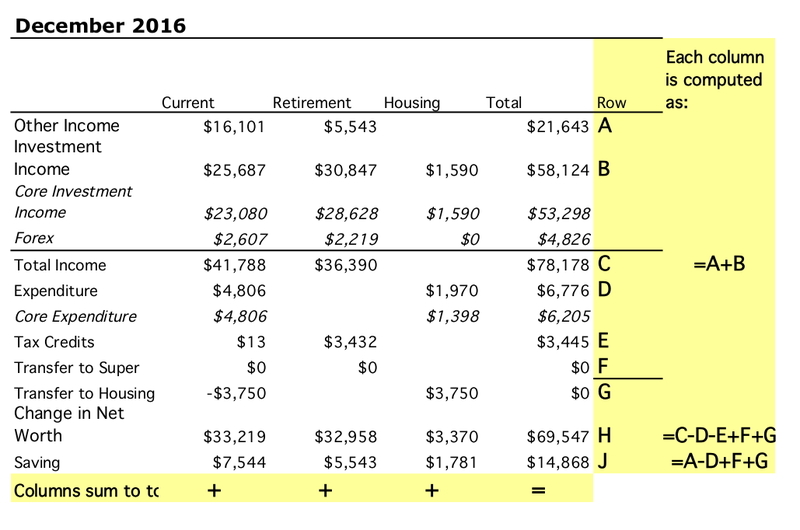 We made $5.5k of retirement contributions, as last month there were three paychecks and there is a delay in getting the superannuation contributions, and saved a net $1.8k in added housing equity. Net saving was, therefore, $14.9k across the board, which is roughly the same as last month but very high by recent standards. The Australian Dollar fell from USD 0.7386 to USD 0.7229. The ASX 200 gained 4.38%, the MSCI World Index gained 2.20%, and the S&P 500 1.98%. We gained 3.96% in Australian Dollar terms and 1.75% in US Dollar terms. So, we again underperformed both the Australian market and the international markets. The best performer in dollar terms was again the CFS Geared Share Fund, which gained $22.5k followed by Clime Capital (CAM.AX), which gained $4.9k. The only investments to lose money were the China Fund and the CFS Developing Companies Fund, which was down $0.8k. Every asset class gained. Many of our investments are at all time highs in terms of cumulative profit: CFS Geared Share Fund, Unisuper, PSSAP, Platinum Capital, CFS Diversified Fund, Clime, TIAA Real Estate, Generation Global Fund, Boulder Income Fund, 3i, and Woolworths. As a result of all this, net worth rose AUD 70k to $1.715 million (a new high) or USD 24k to $US 1.239 million.